A part of growing up for many children! 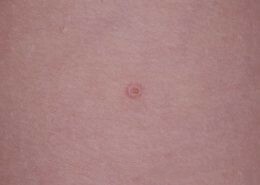 Molluscum is short for “Molluscum Contagiosum.” Despite the alarming sounding name, it’s a common viral skin infection. The condition is very common in kids who can catch it from each other. Molluscum may also occur in adults. The genital form of molluscum in adults is commonly sexually acquired. What does Molluscum look like? Mollosum has a lot in common with warts. 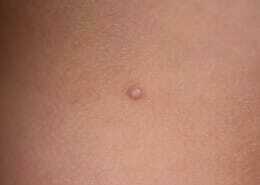 However, molluscum lesions are smaller, have a central dimple, and appear in groups. 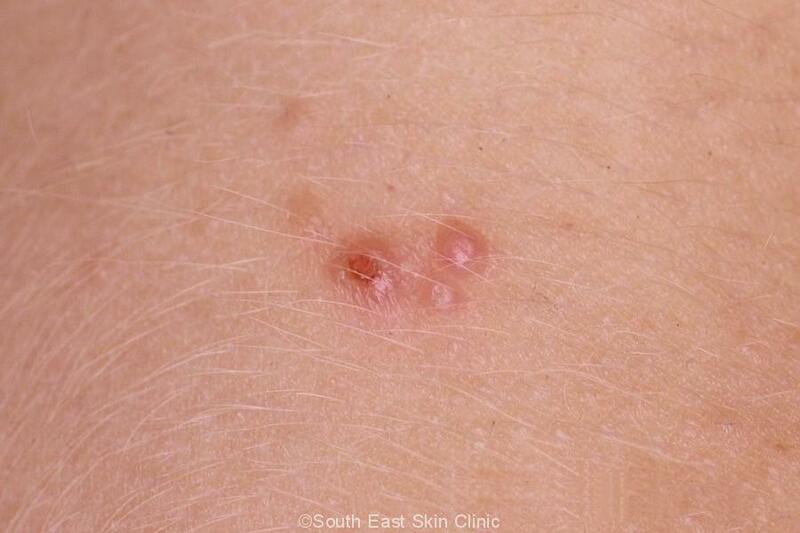 Lesions are usually clustered in groups – anything from 2 to over 30. 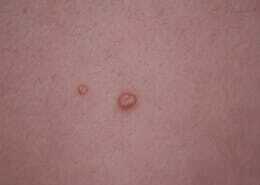 Numerous small ones may be very close to each other and look like a funny sort of rash. Time to get the magnifying glass out. 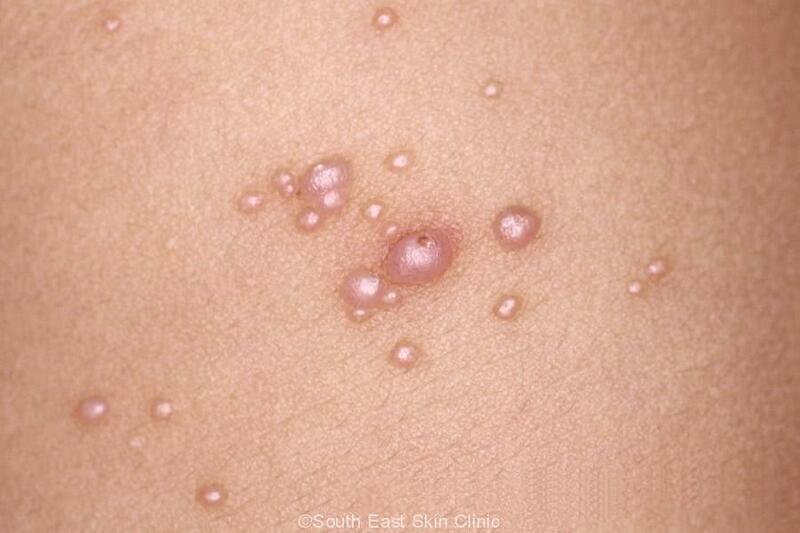 The lesions are usually smaller than viral warts (1 to 6mm across) and are classically described as “dome shaped” . 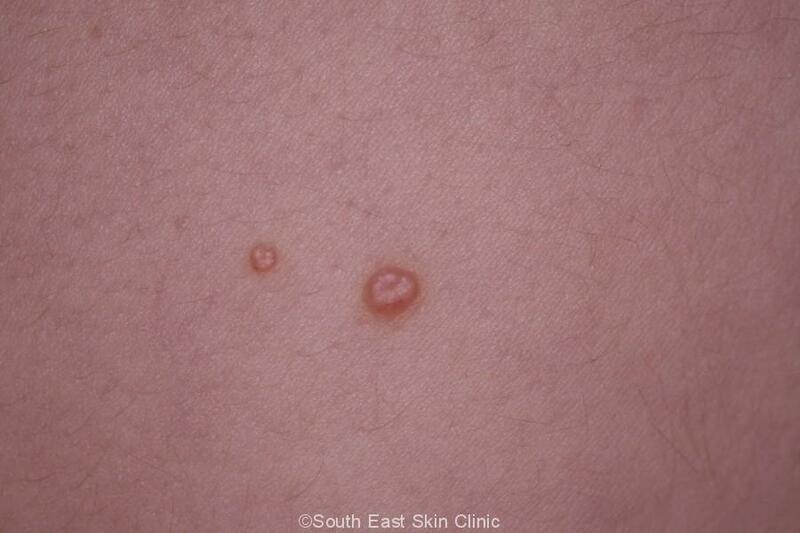 Take a close look at the top of each lesion and you’ll often see a small dimple. They are skin-coloured, pink, red or brown, and are often a little shiny. They do have a fairly typical appearance to the experienced eye. 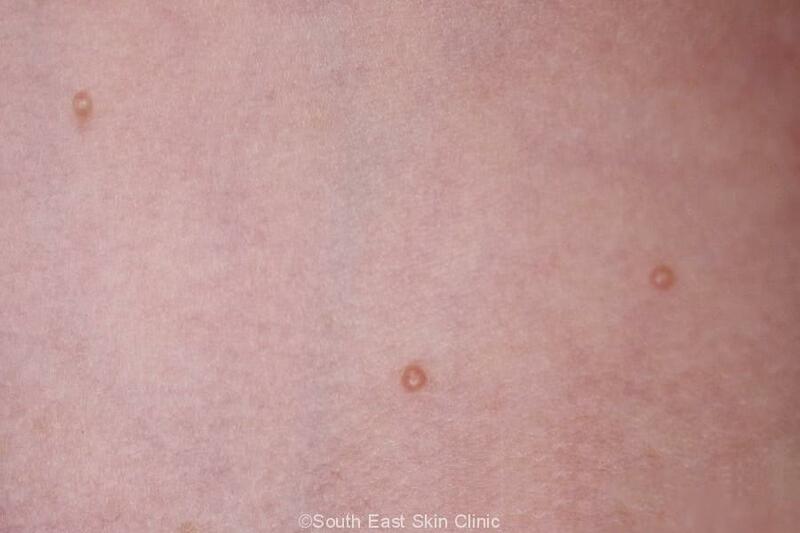 Individual lesions clear up after a few weeks – often to be replaced with lesions elsewhere. As individual lesions start to clear up, they often become inflamed and may even look infected although secondary infection is rare. A different phenomenon is when the background skin becomes scaly. 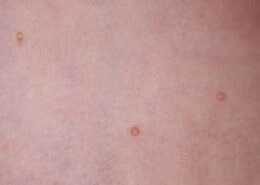 The virus causes a localized eczema in around 10% of people. It’s also worth knowing that molluscum is more common and often more abundant in kids who have eczema. It can then be quite severe. Molluscum can occasionally be up to 1.5cm. A solitary giant molluscum in an adult may look like a skin cancer, and a skin biopsy will likely be required. How long do they take to clear up? The good news is that molluscum clears up on without any treatment. 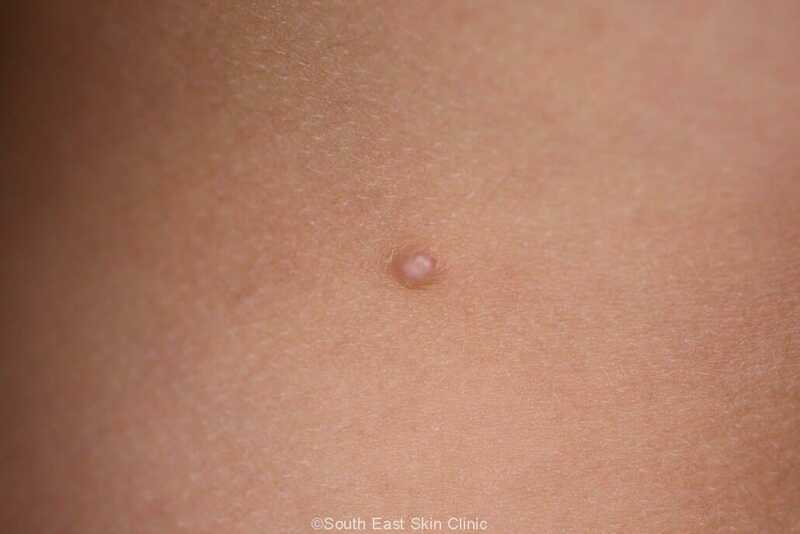 Individual lesions clear up within 2 months. The whole episode, from beginning to end, is usually under 12 months (typically 6 to 9). Rarely the condition takes a year or two to resolve. Is treatment of molluscum needed? 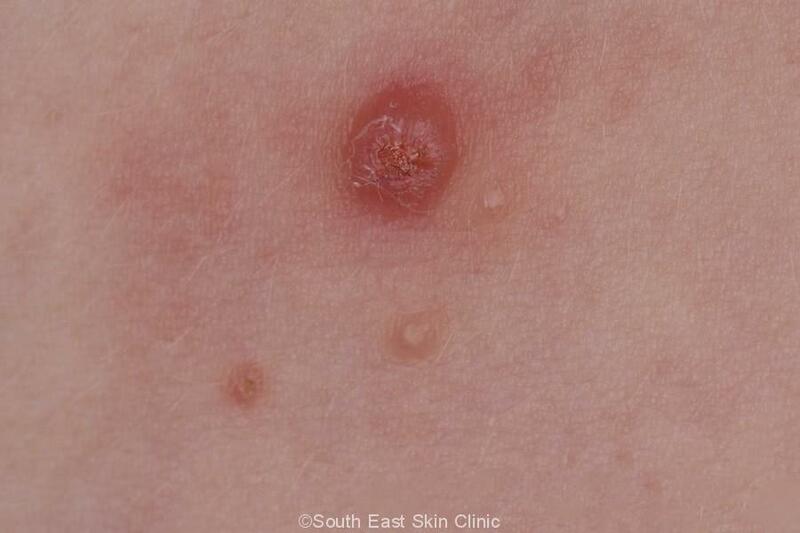 Most adults or parents of kids would want lesions “gone” on the face or in sensitive areas. Treatments may be divided into home treatments, and clinic treatments. home treatment with topical creams does not have a great evidence-base. The idea is to apply a topical cream or gel that irritates or gently inflames the skin and kick-start the immune system into getting rid of the virus early. Topicals include Potassium hydroxide 5% (not easily available in Australia) and Benzoyl Peroxide Cream (usually used as an acne preparation). Self treatment by expressing the contents of each molluscum may be considered in older kids or adults. Doing this after a bath or shower may be easier because the skin will be softer. You can use tweezers that you have previously sterilized with boiling water. Another alternative is to use a sterile pin. Be sure to use gloves to avoid spreading the virus to yourself or another part of the body. This treatment may be painful and does not have a strong evidence-base. Really this is only suitable for adults or older children who are motivated. Clinic Treatments are more effective and includes Imiquimod Cream (prescription-only) & Curettage (this requires a local anaesthetic). Perhaps Cryotherapy (Freezing treatment) is the most widely used treatment in a medical clinic. It should be emphasized that the majority of people or children require no treatment at all. It’s sensible to avoid sharing towels or sharing a bath. Scratching may pass the virus onto another part of the body – so try to avoid scratching! For troublesome itching, a steroid cream may help. Children may swim, attend daycare or school without any worries. 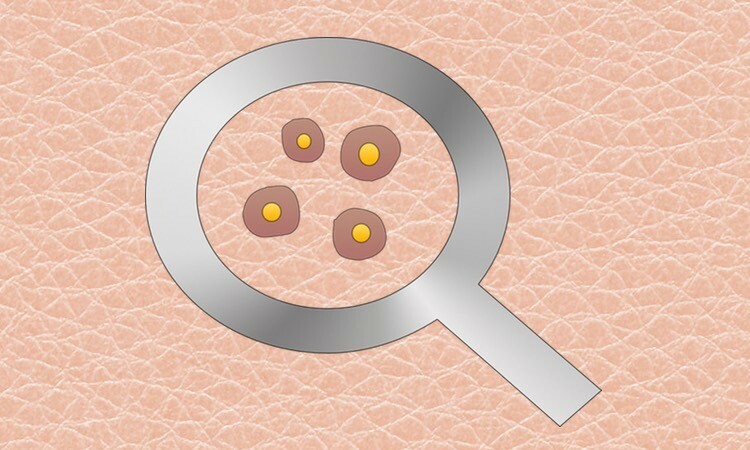 Guidelines do not require lesions to be covered but if your child has very few lesions in an exposed area then you may wish to cover with a bandaid. Here’s a good Australian government health link for ways to prevent spreading molluscum.